Germany doesn't have all that many classic Beetles ("Kafers") running around, I see far more here in Southern California. 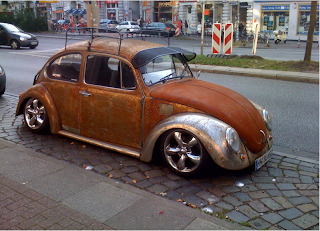 My guess is that a wet northern climate has taken its toll on classic Wolfsburg schteel. 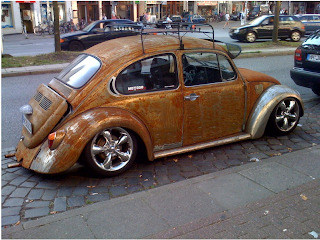 And while this one is certainly rusting, it's an intentional rust job. Step one - grind all the paint off body. Step two - leave to the elements. Step three - let nature take its course. I've seen a few other rat rods with this look. In an effort to make this one look even older, the owner also put the pre-1968 style flared front fenders on. A good look. Actually, the reason I've heard that you don't see that many kafers in Germany is that they reminded people of the war. They were/are viewed as low class and not "cute" like we tend to see them. I don't believe that the New Beetle is as popular there as it is here either.